This is a donkey that is rarely over the moon, being a bit of an Eeyore, but we just had a very nice walk. The magic of the new moon is just two days away and the donkeys seem to sense it coming. We had a really lovely walk, with Rubí smelling the herbs and the rocks, and for once I slowed down and made myself go at her pace, pausing and enjoying the smells and the turn of the breeze. Gradually it began to get dark around us, but there was no hurry: we were just a few steps away from home. Just being, not doing, and just being with Rubí under the moon, that’s good enough for me. But I did go for a lovely walk with Rubí on a perfectly still evening under the moon, which was nearly full, but not quite. Don’t the other donkeys raise a fuss when you take one out for a walk? Normally Rubí has been out with Matilde on walks, and this was the pattern for the first year. Then the foals arrived and I usually walked mother and foal. I tried to get back to walking Rubí and Matilde, just for old friendship’s sake, but the near disaster recently with Matilde jumping on Rubí has put a complete stop to that, for safety reasons. 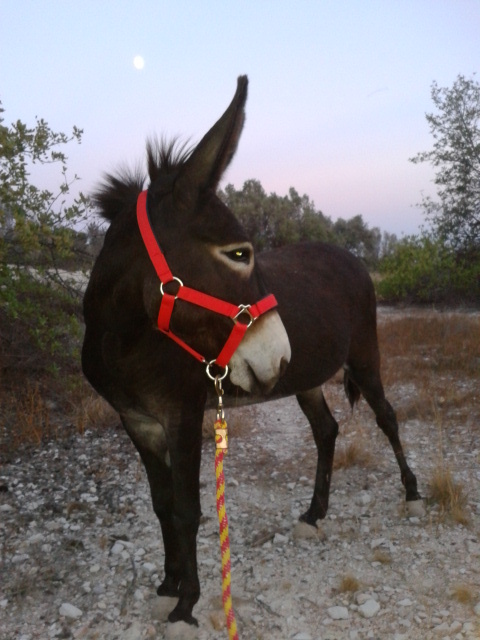 When I am two or three kilometres from home walking donkeys, there will often be loud brays from home and the donkey(s) being walked will respond to let them know where they are.